Do Dining Chairs Have to Match? You know how to match the clothes you wear every day, but do you know how to match your dining room furniture? Matching your dining room furniture may seem very different than matching clothing. There's actually a lot in common between the two though. Both involve matching things with colour, shape, and size. Keep this in mind as you read on, and you'll be a furniture-matching legend in no time. Or maybe you'll learn how to match your clothes for the first time. Either way, you come out a winner. When deciding which chairs and table you want to have in your dining room, try new things and have fun. In the end, it all comes down to how you want the furniture to look. Go with your gut if you're ever stuck, and you'll do great work as a designer. You can adhere to the following principle if you're completely stuck though. Don't have your furniture match too much, and don't have it match too little. The human mind likes to see patterns. If someone walks into your dining room and sees multiple chairs of different styles, colours, and shapes, they'll think you've lost your mind. To keep your furniture arrangement pleasing to the eye, match some parts of your chairs and table, but not everything. There's no right or wrong way to mix and match your furniture, but there are certain ways which look better or worse to most people. You can also choose not to match your chairs with your table and instead match your dining furniture with the rest of the dining room — the art on the walls, the walls, or other decorations. Contrast can be good when matching furniture. You don't always want every piece of furniture to be the same. Mixing and matching chairs and tables is the easiest way to create contrast.. Have something about all the furniture that is the same so they complement each other, yet still have differing qualities to keep contrast unique. Try having something in common between each piece of furniture. Sometimes two different chairs will have nothing in common with each other. If the chairs both have the same colour or shape as the table, for example, the furniture as a whole will still look good. Chairs can be different colours and still look great together. Nothing says boring like single-colour uniform chairs and table. Even if it's only the chair cushions that have a different colour, the overall look will be much better. As an example, the Grace dining chairs come in a variety of colours. Pairing two of these chairs in beige with two in Heron Grey — both with natural beech legs — would work great. We can easily finish this dining set by choosing a table with similar qualities. In this case, a stylish square or rectangular table made of light, natural wood to match the chairs' shape and legs. 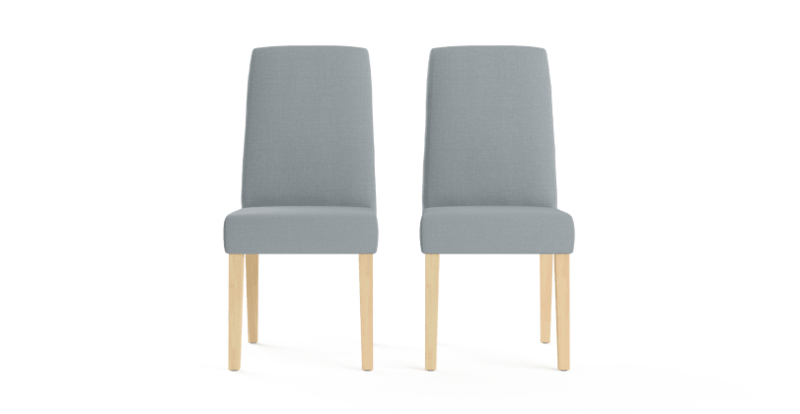 Two different-coloured chairs can look great together if their shapes are similar. Even if not the same model, a similar style will keep things looking coherent and pleasing. Using the same model chair in multiple colours is a great way to liven up a room and make it feel more vibrant and lively. How many colours can you use at the same time? Two or three colours is a good rule of thumb. But just be sure to stick to the same colour palette, and you should be okay. You can find Brosa's tables and chairs in all kinds of styles and colours, so picking out chairs and tables should be easy and fun. Perhaps the look you're going for is more elegant or subtle — something more traditional. In this case, sticking to a single or softer colours could be your best best. But this doesn't mean you can't do your fair share of mixing and matching. Filling your dining room with different chairs of the same style will make the room significantly more attractive. Pairing a few different Scandinavian chairs, for example, does the trick. Chairs and tables of the same style all have similar qualities. This makes mixing and matching super simple for you. Try sorting our dining furniture by Classic Traditional, Contemporary, French Provincial, or any of the other styles we offer. One good way to begin selecting furniture is first to pick a table. 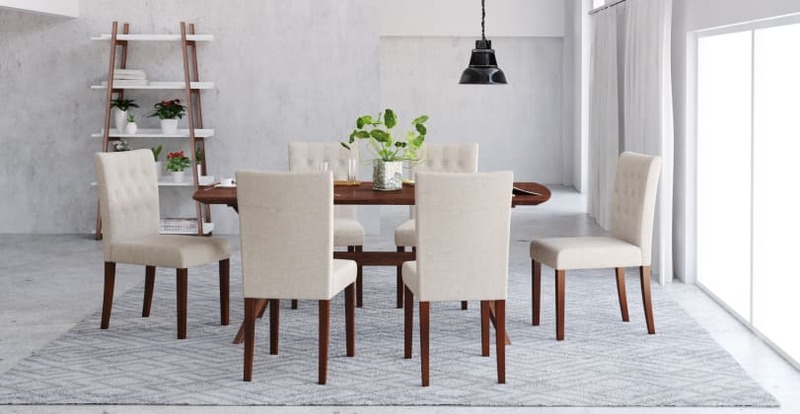 Choose a table that fits your dining room's dimensions and function. Do you have a large dining room and love hosting dinner parties? A long, rectangular table works for this. Is your room smaller, and is it mostly used for everyday meals for a few people? A smaller circular or square table is a good option for you. Once you've selected a table, you can begin picking your chairs. Your table will serve as the basis for the colour and style of the chairs you choose. If you opted for a rectangular or square table, try picking seats that are angular and have a similar shape. 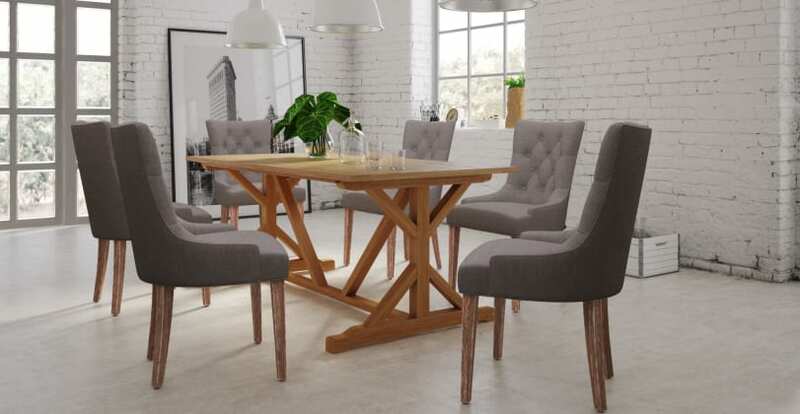 If your table is a light beech colour, choose chairs with the same kind of wood. How should I place my different chairs around my table? Good question. If you have a rectangular or square table, putting chairs in groups works well — put chairs that are the same on the same side of the table. If you have two kinds of chairs, have the chairs that are the same face each other. For example, have the same seats on the left and right of the table facing each other. And then also have the same chairs on the top and bottom of the table. If you have three or more kinds of chair, just follow the group rule. If your table is circular, you have a bit more freedom with chair placement. Your furniture will still look great if you don't place the different chairs in groups. You can also arrange the chairs like you would with a square or rectangular table. Following these few guidelines, you'll have a beautiful and functional dining set in no time.